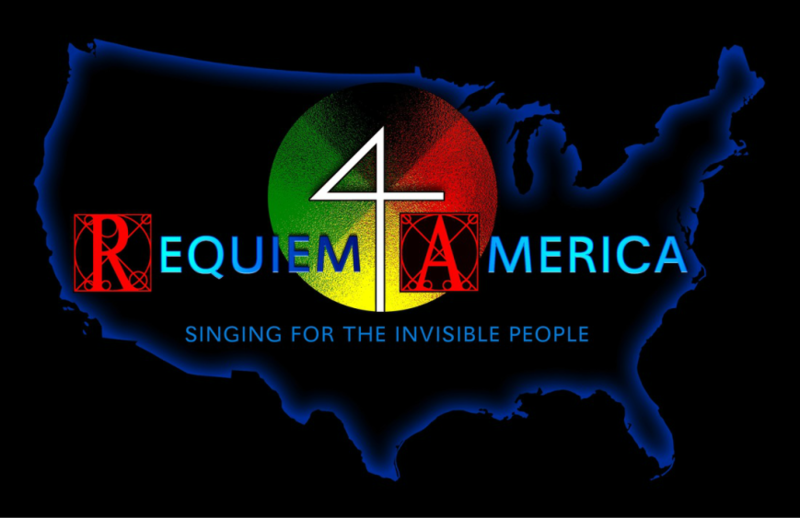 In movement one, “Requiem aeternam: Invisible People,” a dark chorus overshadows the Native American flute and transparent strings, evoking the overt foundation that has rationalized away America’s indigenous people. The chorus vocalizes the biblical passages upon which the American genocide was justified, while the indigenous chorus remains silent. We hear the dichotomy clearly, but also feel the native people under the surface, much like in today’s America. “Kyrie eleison: Sharing the Flower” introduces two considerations that are the cornerstone for REQUIEM namely, who are the invisible people and what is the basis of their world? Responding to these questions, the second movement opens as a flower to the dawn, where sparkling woodwinds and strings help unfurl the history of American relations with the Indians from an indigenous point of view. In the more contemplative offertory portion of REQUIEM, the movements “Domine Deus: Grandmother Giveaway” and “Hostias: Breaking Frybread” honor important gifts from the invisible people. With music of striking complexity, these two movements highlight American Indian rhythms, chanted in solos and layered in choruses. The text for the Sanctus movement, "Singing for Power," relays a telegram sent by chief Standing Bear to President Hayes asking why the Ponca were cordially invited to consider relocating to the Oklahoma territory, but were provided no return travel and forcibly left there to starve. Indigenous singers mix with the western chorus, accentuating how America's indigenous people call out for recognition and dignity. From its dark beginning, the movement becomes a chorus of encouragement and compassion revealed in the traditional American Indian singing. “Benedictus: Thanksgiving Ceremony” is a setting of the first Thanksgiving proclamation by Massachusetts Bay Governor John Winthrop that, shockingly, celebrated the 700 Pequots murdered in the Mystic Massacre. The concluding movement of REQUIEM, “Libera Me: Singing for Life” uncovers a uniquely American story: the historic struggle to be heard and understood, a multi-generational vow to an indigenous principle of harmony valuing all our relations. ​To add your voices and join the consortium, please visit the CONTACT page! Is it simple to be a Mohican in today’s America? Or a freelance composer? No to both questions. Despite the challenges, I’ve dedicated my life to voicing tribal people’s perspectives in the concert music world where there is precious little influence. I strongly believe that when we collaborate and experiment in song, we are discovering life benefits, not simply musical ones. Our interactions as composers, performers, audiences, students and teachers—Indian and non-Indian alike—constitute important relational skills. If we can excite creativity and cooperation in each other, we have accomplished a magnificent thing! Growing up as an American Indian—living on a reservation—there are clearly opportunities for the expansion of indigenous thought into Western music. My continuing hope is to challenge the largely Western-European world from the inside, as one of the few American Indians with scholastic training as a composer. My work is acoustic and experimental, lyrical and edgy, sophisticated and mature, imaginative and well-crafted. I emphasize ‘sound’ creation to sow the seeds of timbre and melody in my works. In pursuit of new sounds, I develop original musical instruments derived from Native American ones. By modeling indigenous wood flutes, I’ve created quartz crystal ones. From traditional Native American “bull roarers,” I’ve developed spinning aerophones that chirp and coo. Today, living in my own Mohican community in the forests of Wisconsin, I compose music that speaks with a strong indigenous voice. My American Indian relatives inspire me and give me hope for our shared future—the future of the planet. I stand with the Water Protectors of the Earth, and my music remains my best and loudest voice! When American composers are described as “native” the definition is not usually as accurate as when applied to Brent Michael Davids, an American Indian and enrolled citizen of the Mohican Nation. Davids’s composer career spans 40 years, including multiple awards from ASCAP, National Endowment for the Arts, Rockefeller Foundation, Meet The Composer, Park City Film Music Festival, Sundance Institute, Gold Medal In-Vision Award, Native Arts & Culture Foundation, Bush Foundation, Emmy Awards, School for Advanced Research, McKnight Foundation, Jerome Foundation, and American Music Center, among others. In 2006, the National Endowment for the Arts named Davids among the nation’s most celebrated choral composers in its project “American Masterpieces: Three Centuries of Artistic Genius.” And in 2015, Davids was given the “Lifetime Achievement Award” by the Indian Summer Music Awards at the Indian Summer Festival in Milwaukee. Commissioned by the National Symphony Orchestra, his “Canyon Sunrise” commemorated the 25th Anniversary of the Kennedy Center and the 60th Anniversary of the NSO. Garrison Keillor asked Davids for an orchestra work, “Prayer & Celebration,” that premiered on “A Prairie Home Companion.” Davids was commissioned by Grammy Award-winning Chanticleer, for “Night Chant,” “Mohican Soup,” “Un-Covered Wagon” and “Leather Stocking.” Davids’s “Black Hills Olowan” premiered with the Porcupine Singers and the South Dakota Symphony Orchestra on SD Pubic Television. His new opera “Purchase of Manhattan” premiered in Manhattan to rave reviews in 2014. Davids holds Bachelors and Masters degrees in Music Composition from Northern Illinois University (1981) and Arizona State University (1992) respectively, trained at Redford’s Sundance Institute, and apprenticed with film composer Stephen Warbeck (Shakespeare In Love). He has garnered the Distinguished Alumni Awards from both of the universities he attended, NIU (1996) and ASU (2004).